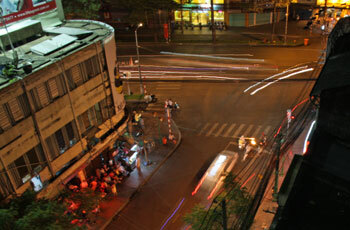 I had mixed feelings about finally arriving in Ho Chi Minh City after three months in Vietnam already. It’s even larger than Hanoi, and I’d consistently heard from people who’d spent time in both of them that they prefer Hanoi over Saigon. I found Hanoi to be fascinating, but also overwhelming, so I had a feeling that this might be a bigger and more crowded version of Hanoi. After a seemingly interminable bus ride from Dalat (it took 8 hours and the first 4 of those were actually fantastic), we arrived on the outskirts of Saigon. It wasn’t until about an hour later that we made it to the city center, and this is one of many things that would remind me of Los Angeles. After spending 18 days in the mild Dalat weather, it was a rude awakening to arrive in Saigon, where it was about 96F and extremely humid. I looked it up online a bit later and the Heat Index was 126F, which was certainly the most extreme of my trip so far. I’d had the Dalat hotel woman call for me and reserve a room at a place called the California Guesthouse. 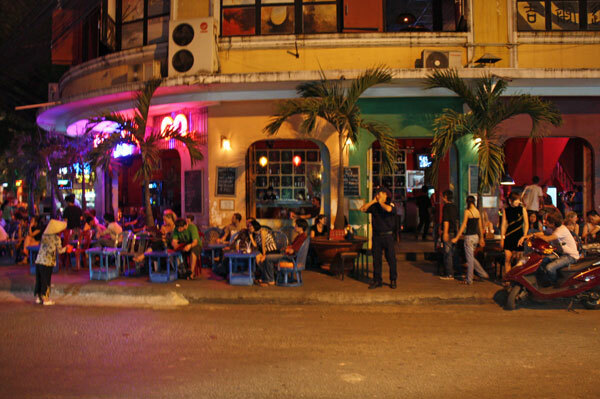 It is located about 6 blocks from the main backpacker area in District 1, in a cluster of small hotels that were said to be a good alternative to the madness of the central area. It turned out that the only person who speaks any English at all at the California Guesthouse was the daughter, who was elsewhere when I arrived. The mother first had me wait for a while, and then she sent me to another hotel down the block. Later I came back to find that they had indeed held a room for me, but the mother didn’t know about it, but by now I was checked in to the other place. 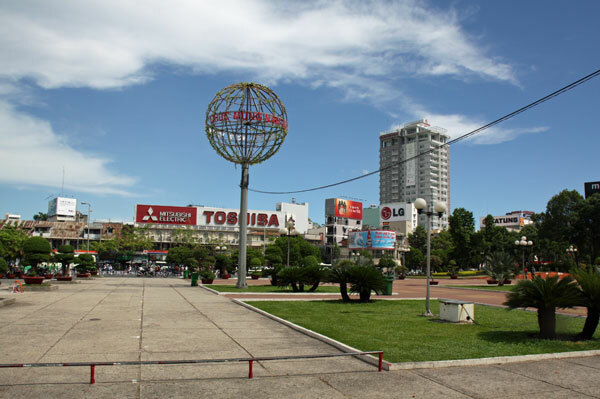 In other cities in Vietnam I’ve really enjoyed staying a bit outside of the tourist heart, but this cluster of hotels seemed to have no tourist restaurants or shops nearby, so that would mean having to go at least 4 or 5 blocks every time I wanted anything. It wouldn’t have been so bad, but the whole area was very thick with local businesses and such and heavy with traffic, so walking longer distances in this area was not fun. After that first night I checked out and then check into a nice place in the heart of the backpacker district, where I stayed for 9 total days. Just by riding in on the bus (I was riding shotgun), I could see that this is a massive city, and especially once you get near the downtown area, it’s much more modern than Hanoi. There are hundreds, if not thousands, of tall apartment and office buildings, with many dozens currently under construction. Most of the main sights are within the downtown area, but still the sprawl here was a bit intimidating and a bit surprising. 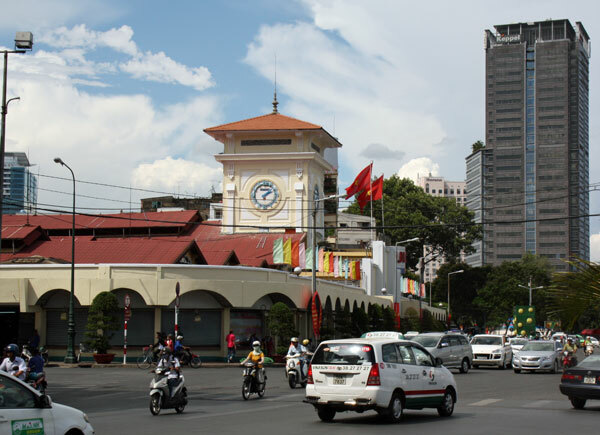 The historic center of Hanoi definitely feels like a European-influenced town that was laid out before cars and car-parking were considered, but Saigon feels almost American in that regard. Still, about 90% of the road traffic was motorbikes rather than cars, and it’s not really well designed for those. For the record, there is an active debate about which city has crazier motorbike traffic, and I think Hanoi is far crazier. Saigon may have just as many motorbikes on the roads, but all the streets are wider and there is traffic control (stop lights) at nearly every intersection. 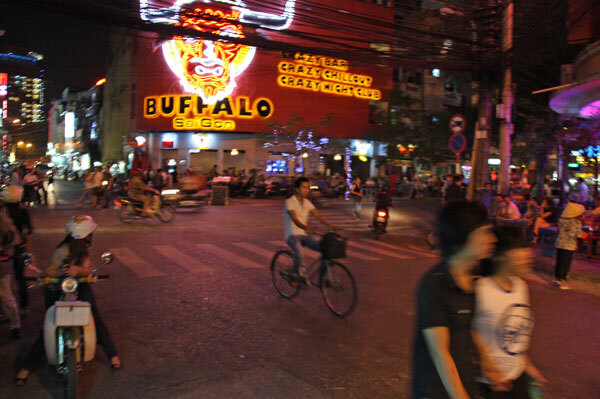 Another big difference that surprised me was the backpacker district has several big nightclubs, which literally rage on into the morning hours. It’s clearly operating as a buffer between the West and the real Vietnam. It’s sort of a clumsy and over-the-top introduction to Vietnam, which might actually scare more people away from the rest of the country than entice them to see the rest. Another thing I had heard before was that the street vendors in Saigon have no equal, and this part turned out to be true. If you stay and drink and dine in the heart of the backpacker district then you learn this quickly, and if you keep hanging out there you can’t really keep complaining about it, but still it’s amazing. In front of my hotel there was always at least one or two motorbike taxi drivers who’d ask if you want a ride the moment you step out front. Then there are several more on every street corner, and they ask pretty much every time, even after you turn them down 20 times in a row. As mentioned before, I now wear earbud headphones pretty much every second that I’m out and about, mostly so I can tune these offers out more easily, but also to combat all the motors and bike horns. Then, when you sit down at one of the many restaurants in the neighborhood it’s never more than a few seconds before someone comes by trying to sell you sunglasses or cigarettes or books or souvenirs. If you sit out at the front tables they will literally often line up so one is waiting for a vendor to move on so they can begin their own pitch. Once you realize this part you begin selecting tables well inside the restaurants, but this only filters out the weakest of them. Even in places like Mexico the restaurant owner will shoo away these intruding vendors that are ruining the experience of their customers, but here the vendors have an all-access pass. I’d love to hear the training they go through, because they all have nearly identical styles. They come by and politely inquire if you are interested in what they are selling, and the tourist will politely say no and maybe even explain why. I think they literally don’t know the meaning of the word “no,” so they continue to stand there and maybe they’ll suggest something else from their selection. I’ve tried not making eye contact at all, and not only does that feel a bit rude for a guest in their country, it doesn’t seem to phase them at all, as they’ll just stand in front of you for a minimum of 20 seconds just to prove that ignoring them is futile. The only bright note is that they do seem to remember the tourists pretty well, so after they’ve pitched you twice or so they’ll often move along after only 5 seconds and one query on future meetings. One of the weirdest, and also most common items you see throughout Vietnam is books. Whether they are men or women, they’ll have a stack of at least 20 or 30 books, including Lonely Planets, books about Vietnam, and current bestsellers. I already have one Lonely Planet and I’ve switched to audiobooks for everything else, so I never looked closely at these street offerings, and it wasn’t until I reached Nha Trang that I learned they were photocopies of books, and sometimes had pages missing or out of order. This explains how books like this can be sold for $30 and up legitimately, but around $10 on the street. I spent 10 days in the city, and on most of those I was working at least 5 or 6 hours in my hotel, but I did have a chance to see some of the main sights. There are things like a few cathedrals and pagodas and a Chinatown that I never looked into, since I’d seen so many of those elsewhere on this trip and on previous trips. I decided to just hit the main and unique ones that actually interested me. 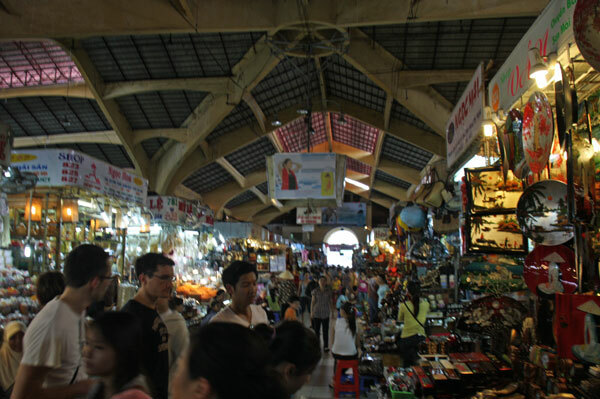 Only about half a mile from where I was staying is the main central indoor market for District 1 of Saigon. I’ve mentioned this before, but again, I do generally like shopping, but on a trip like this I’m going out of my way to buy only things I need or perhaps a tiny souvenir here and there. For this reason, going to these markets can be more than a little frustrating, and I only have myself to blame. Seeing all the local produce and meats and god knows what else that these people sell one another daily at their main market is fascinating from an anthropological sense, and I’ve spent a lot of time doing this in the past. The problem is that, at least within one small country, they tend to be alike. So the first one can feel amazing, but the 7th one feels awfully familiar. Another problem is that the markets that double as tourist destinations all have various souvenirs mixed in, and the merchants on hand will call out to you as you pass pretty much every time. If I were in Vietnam for one month and then headed back to my house it would be great to buy an extra suitcase worth of trinkets and souvenirs, but when you don’t officially have a home and won’t be going back anywhere anytime soon it’s pointless. So for this market I quickly walked through looking at all the local stuff and saying no thanks to the souvenir dealers, quickly exiting again and wondering why I’d even gone in at all. 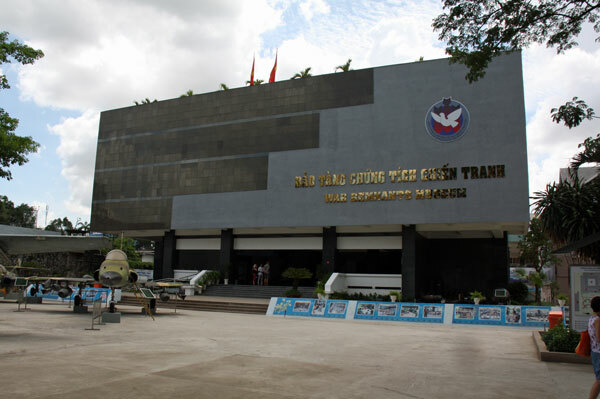 Also within walking distance of my hotel was this grand building, which is surrounded by gates and grassy areas, and evidently was the main strategic base for the South Vietnamese Army, and also the sight of their last stand. 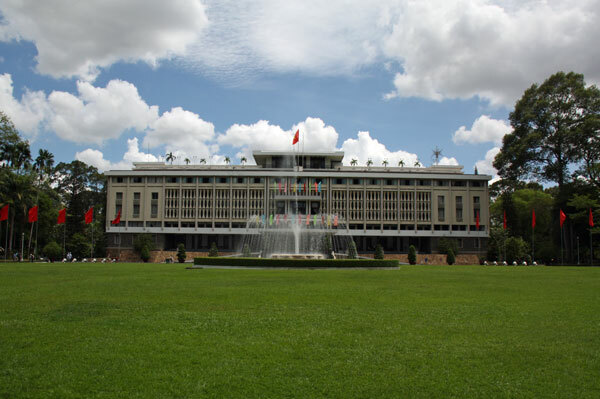 Today they say it’s used a few times a year by the federal government (based in Hanoi) for meetings, but it’s mostly just a time capsule and tourist attraction. It appears that literally nothing has changed since 1975, when the North finally conquered the South. 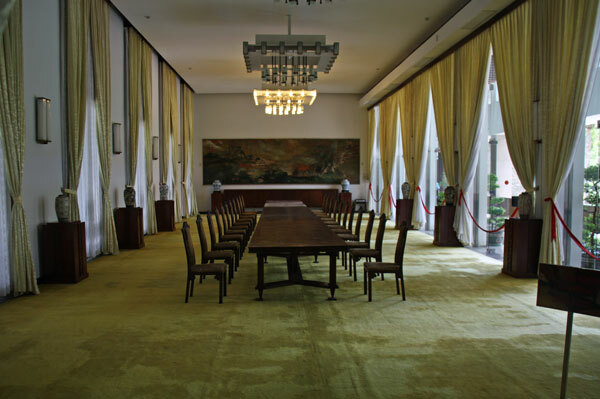 There are conference rooms and the residences of the premiere and first lady, as well as the underground command center, a movie theater, dance floor, and even a helicopter landing port on the roof. Admission was only 75 cents so I was surprised that it included a one-hour guided tour from a lovely female guide who spoke pretty good English. It looked like the Chinese-language tour had a much bigger group, but still there were almost 10 of us in the English group, including (curiously enough) three Japanese guys. 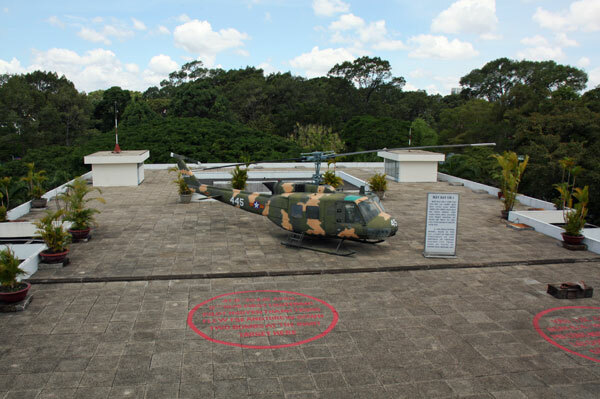 I guess since this is sort of like Vietnam’s southern White House, and a major source of pride, they make sure that visitors actually learn what it’s all about, which isn’t true at many attractions in this country. This seems to be the most touted attraction in the city, and it was originally called “The House for Displaying War Crimes of American Imperialism and the Puppet Government [of South Vietnam]” and then “Museum of American War Crimes,” then as the “War Crimes Museum,” but I don’t think the displays have changed much since they changed to the current name. Some guidebooks even go so far as to say that in spite of the obvious propaganda inside, it’s important for Americans to see the (North) Vietnamese version of the events, but I honestly found it quite tame. Perhaps they actually have rewritten most of the captions, because the entire inside of the museum consists of blown-up photographs with an explanation of what might have gone on there. For example, one photo was of some village people, and the caption said, “This photographer said that right after this was taken these people were gunned down by American troops.” There are photos of American soldiers, some of them wounded, but again there really isn’t anything that accused the US of anything unusual. Even if you accept their versions, it’s nothing that we haven’t heard a million times before about every war in history. There are, of course, some John Kerry quotes, but none by all the people in his battalion who disputed his version as dishonest and politically motivated. So he joins Jane Fonda as someone who is a minor star in the North Vietnamese version of events, but again nothing new or shocking. Outside there are some tanks and planes and helicopters and guns and such. 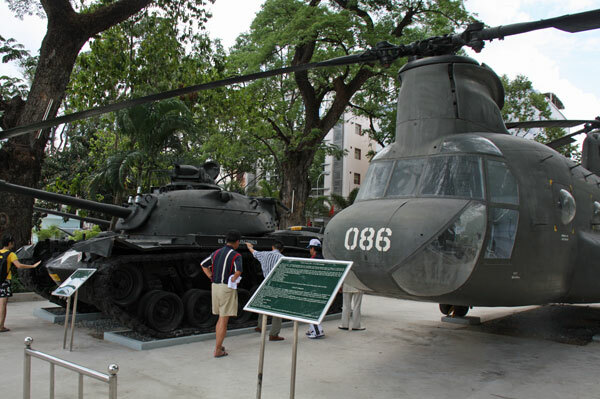 I guess they were American built and captured when Saigon fell, but even that part isn’t too clear. Overall this is an interesting stop, but the more I think about it the more I think they must have toned down some of the crazier stuff in recent years. 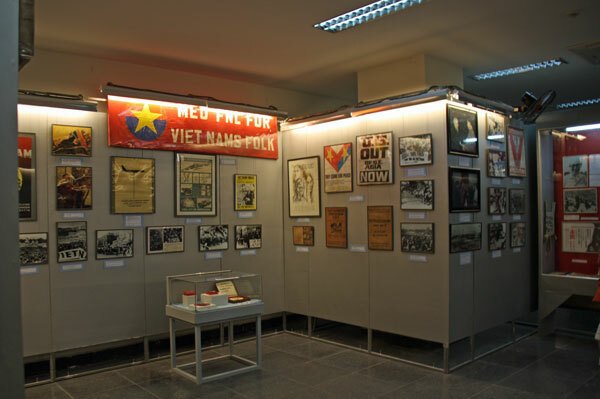 It seems the Vietnamese government is anxious to have good relations with the US, so having such a hostile museum in its most popular city might have been unconstructive. Also, Americans are very welcome in Vietnam. The first question that anyone here asks a tourist is “where are you from,” and when I say America I get nothing but, “oooh, that’s nice,” and a smile. They’ve had two wars since the American War here, and most people here are young and don’t hold a grudge at all. I think at this point “American” is a code for a tourist who is more likely to overspend and at least a little likely to tip in a restaurant. 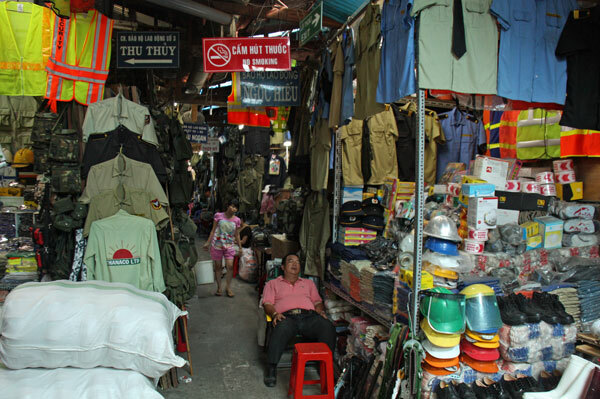 One of the stranger attractions I wanted to see in Saigon was the famous market where they sell old American war surplus. Evidently in the years or even decades following 1975 you could buy cheap army supplies from this one market, which happens to be located only a few blocks from my hotel in District 1. It turned out to be disappointing, but not at all surprising. It’s actually the exact same phenomenon that has plagued “army surplus” stores even in the States. 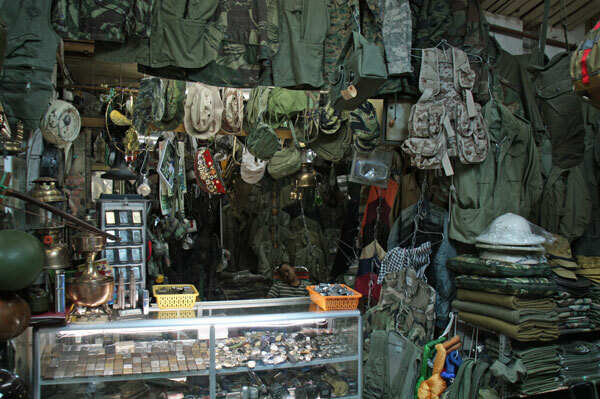 Even into the early 1980s they seemed to have actual fatigues and other clothing for sale, and at very low prices, but since then I don’t think the army has much extra stuff. So army surplus stores end up stocking brand new and often cheaply made versions of the same basic stuff, and try to sell it at weirdly high prices. This is what has happened to the Dan Sinh Market as well. I went over there around 1pm, which is smack in the middle of the siesta hour, so things were very quiet. For some reason I had pictured this market being outdoors, but it turned out to be all indoors, in a very crowded building. Many of the merchants were actually fast asleep, and it always amazes me a bit the level of trust and honor they all seem to have. Anyone could grab nearly anything from one of these stalls and just walk away with it while the person is sleeping, but no one does. I’m sure the electronic stuff is all kept safe, but still it’s really nice to be in a place where everyone assumes everyone else is honest. Evidently the main item that used to be popular for tourists to buy was a Zippo lighter once used by a GI. I’ve read that the authentic ones have been gone for a long time, so now there are thousands of new lighters with various things etched into them that resembled the originals. You can buy those from half the vendors walking up and down the streets, and several of the stalls in this place had large selections of them. A bunch of other places had green army-looking outfits, but all of it was new and none of it was interesting. There were also plenty of places selling electronics and other miscellaneous items. I found a really good Swiss Army-style knife at one place and the woman told me it was 100,000 dong ($5). That sounded like a fair price, but I hear that locals don’t respect you if you don’t haggle. I offered 60,000, hoping to get it for 80,000, and she just kept repeating “100,000 maximum.” I walked away hoping she’d drop the price, but she didn’t. After looking at a few more stalls I realized no one else had these knives, but still I couldn’t bring myself to give in. Later that day I was eating at a restaurant in the hotel district and a roaming merchant kid came up and among other things he had the same knife for sale. He started at 600,000 dong ($30), and after continually insisting that I knew exactly where I could buy one for 100,000, and him telling me I was mistaken, I bought one for 120,000 from him. As long as the sellers are friendly here I don’t mind paying more for things. Next stop, Can Tho and then Chau Doc in the Mekong Delta, and then on to Phnom Penh in Cambodia.